While iced tea is probably the drink most synonymous with summer, I find that most could use a little something extra. A little more flavor, a little pizzaz so to speak. Enter the watermelon. Summer is the perfect time for fruity drinks and watermelon is the perfect fruit for summer drinks. 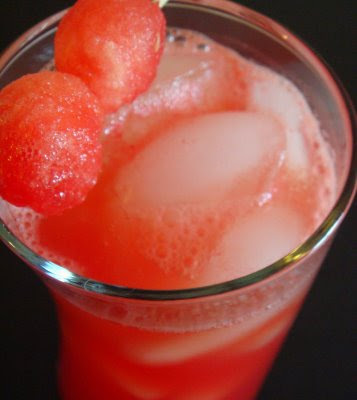 Add fresh watermelon juice to freshly brewed tea and you have an exciting and refreshing summer drink. 1. Pour hot water over the tea bags, cover and allow to brew for at least five minutes. 2. Meanwhile, puree the watermelon in a blender, strain and discard the pulp. In a large pitcher, add watermelon juice and tea. Sweeten with honey if desired and stir well. Chill before serving or serve immediately over ice cubes. This sounds so perfect. If it ever warms up and stops raining, I'm so there! Love the color and a great way to use watermelon. Gotta try this one! Thanks for your comments here everyone! This recipe was one of the top nine on Foodbuzz.com last week and today is part of the daily special. How many cups of juice do you end up with after pureeing the watermelon? Liftsarah, after pureeing and straining thoroughly, I ended up with about two and a half cups.